Looking for small bedroom decorating ideas? Then read our guide on how to update your small bedroom with our top tips. It can be difficult updating a small space, especially a bedroom. You want it to showcase your tastes and personality, but you don’t want to overpower it with too much decor. You also want a room that allows you to relax and get a good night’s sleep as well as space for getting ready each morning. So what’s the best way to decorate a small bedroom? Below are some helpful hints to get you started. If you want to creating the illusion of space in a small bedroom, then opt for bright or light colours. White will help a small room look much bigger than it actually is, so it’s best to go for white walls. But don’t automatically think white equals boring. A white textured wallpaper can add both the illusion of space as well as style to a small bedroom. A white damask wallpaper or white brick effect wallpaper is a great alternative to plain white painted walls. 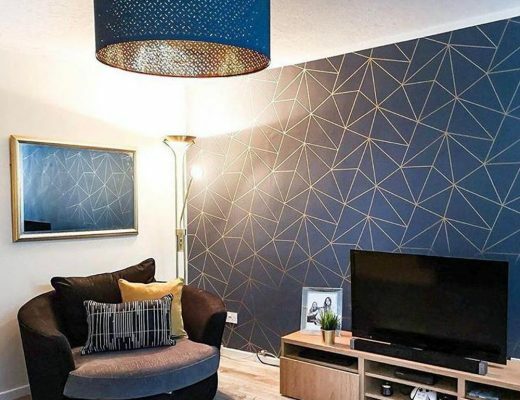 If you love the idea of wallpaper in your bedroom but don’t want to overpower the room, why not add some wallpaper behind your bed and create a feature wall? This is also a great alternative to a headboard and allows you to add some bold patterns and darker colours without it taking over your space. Our Versace Greek Key Wallpaper can be seen here placed behind a bed and we’re sure you can agree it looks stunning! Love a pattern but fear it may be too much in such a small space? Opt for a geometric pattern. This effective print is the perfect combination of style and subtlety and can easily be placed in a small bedroom and allows you to play around with different colours and shades. 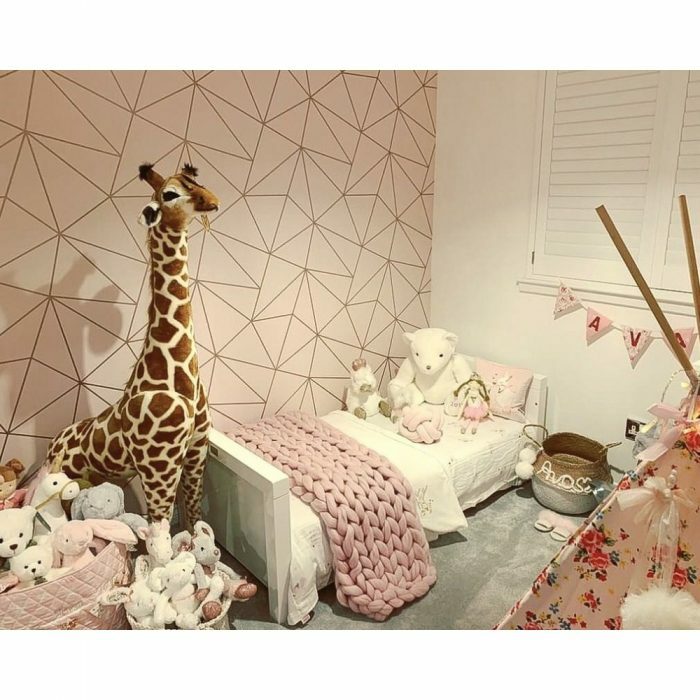 This photo comes from one of our customers who has used our pink and rose gold geometric wallpaper to decorate their little girls bedroom, creating an adorable space for their little one. 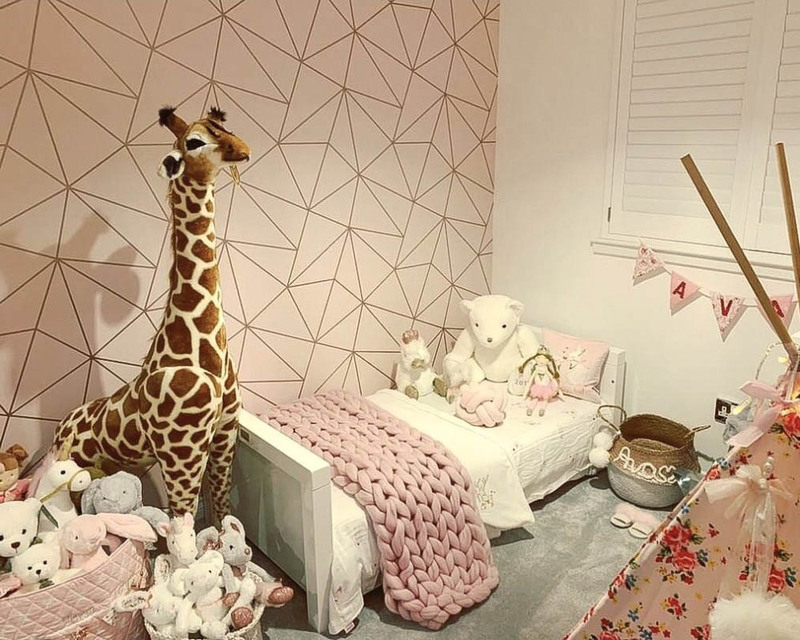 Just because you have a small bedroom, doesn’t mean you can’t be a little bit extra with your decor. A touch of gold here and there is the perfect way to add brightness to a small room and create the illusion of more light and space. Our gold and champagne marrakesh print wallpaper screams opulence and will add a touch of luxury to any bedroom, no matter how small it may be. You may think a floral pattern is too overpowering for a small bedroom, but think again. Floral wallpaper, when chosen properly, can create a beautiful space. If you are adding flower patterned wallpaper to a small bedroom, make sure you choose this in a subtle shade such as grey or beige. This allows you to add the floral look without it over taking your bedroom. 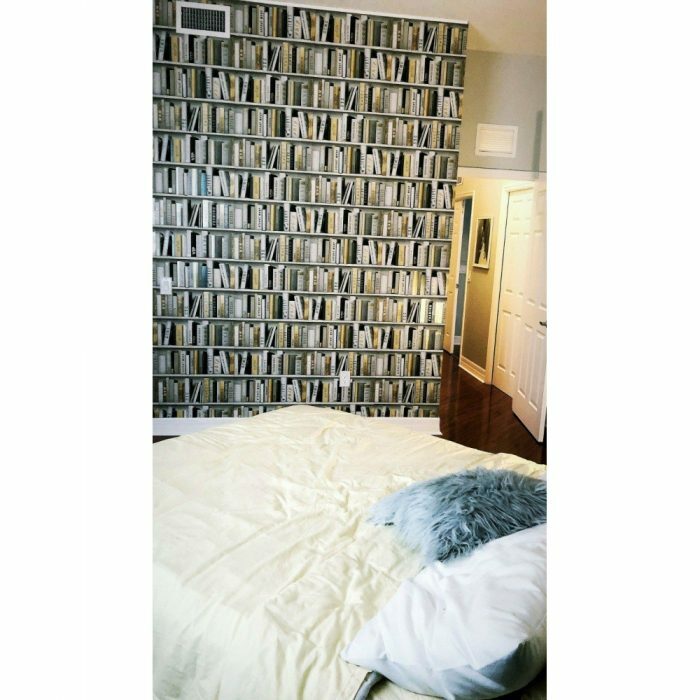 Another one of our small bedroom decorating ideas you might not have thought about is bookshelf wallpaper. Want to create the illusion of a bigger room even further? Then fake a library. Our bookshelf wallpaper will help to create the look and feel of a much bigger bedroom. Simply add this unique wallpaper to one wall of your bedroom to fake the look of an entire library in a small room. 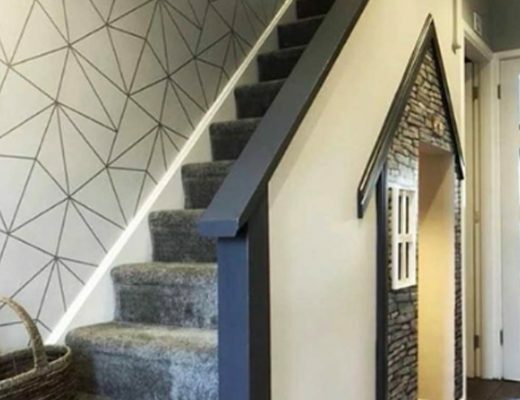 Want to make a statement in a small room? Then glitter wallpaper is the way to go. 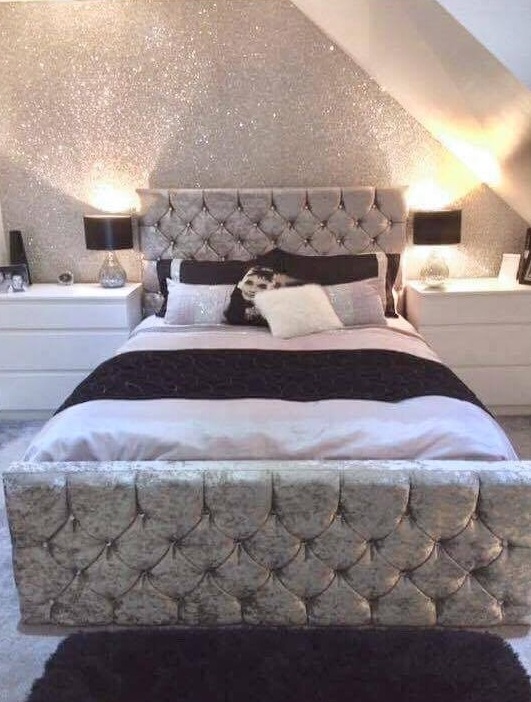 A little bit of sparkle is all you need to add that much needed update to your bedroom. Place some glitter wallpaper to one of your walls and match it up with some complimenting paint and your small bedroom is now a stylish space of your very own. Plus, the shimmer effect will create the illusion of extra light and space in your small bedroom! A few more small bedroom decorating ideas and hints from the I Love Wallpaper Team…. Save space with shelving. A small bedroom is always going to be short on floor space, so opt for shelves when it comes to storing your necessities. Keep your furniture simple. Don’t use up valuable space with too much furnishings. Only use pieces that are essential. A bed, a wardrobe and either a chest of drawers or a dressing table are all you really need in a bedroom. Add a mirror and create the illusion of light and space. A full length mirror placed on your wall will help to add extra light and make your room look that little bit bigger. Or you could go one step better and choose mirrored furniture. Choose a bed that has plenty of storage space underneath it. This will help to save space for the rest of the room and keep things looking neat and tidy too. Consider vinyl or laminate flooring to help your small bedroom look bigger. The wooden panel pattern will help to create the feel of a much larger space. 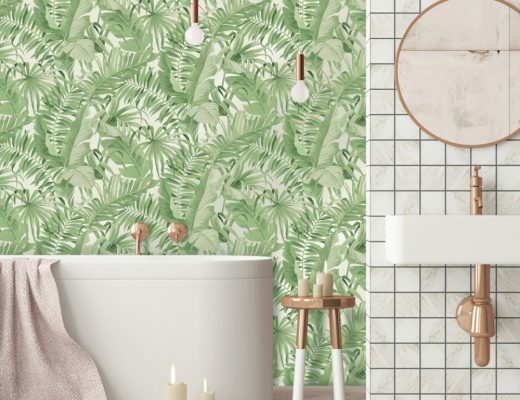 For even more home inspiration, check out our Instagram where we have plenty of decor ideas for you to scroll through! From small bedroom decorating ideas to living rooms, kitchens, hallways and more, you will find an array of wallpaper ideas on our Insta! Founded in 1993, I Love Wallpaper was born out of a desire to better meet the needs of unloved walls. Understanding that walls had more to say than 'magnolia', we made it our goal to create a collection of designs which did just that.